Simple excision—A scalpel is used to cut out the lesion. Curettage and electrodesiccation—The cancer is scooped out with a sharp, spoon shaped tool. The tool uses a mild electric current to stop bleeding. The current also kills any cancer cells that may have been left behind. This is used for small skin cancers that are not deep. Cryosurgery—Liquid nitrogen is used to freeze and kill the cancer cells. After the area warms up, the dead tissue falls off. More than one freezing may be needed. This may be used to treat small cancers or those on top layers of skin. It may also be used on skin conditions that may turn into cancer but are not yet. Basal cell carcinoma of the skin. EBSCO DynaMed Plus website. 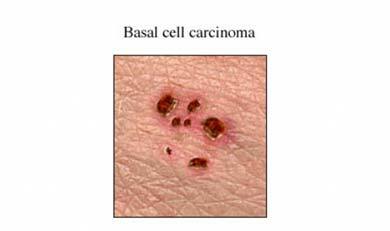 Available at: http://www.dynamed.com/topics/dmp~AN~T113813/Basal-cell-carcinoma-of-the-skin. Updated February 27, 2018. Accessed March 6, 2018. Cutaneous squamous cell carcinoma (SCC). EBSCO DynaMed Plus website. Available at: http://www.dynamed.com/topics/dmp~AN~T116909/Cutaneous-squamous-cell-carcinoma. Updated October 23, 2017. Accessed March 6, 2018.